The road winds its way up the Lais River Valley to Adolfström. 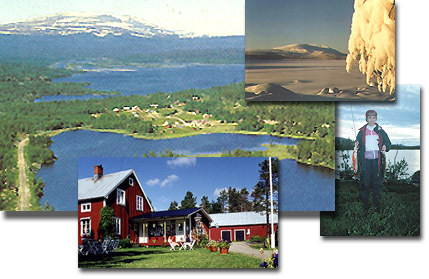 One of the nicest spots in Arjeplog District, with good fishing in magnificent mountain scenery; the Yraftdelta with hay-meadows, sandy shores and crystal-clear water. There you will find us, a small modern centre where we put personal service first. Around us there are lakes where you can rent a boat to fish for salmon trout and char. Our cabins are in different price groups and we have an amenities building, conference facilities and a cowshed café featuring Lappish (Saami) specialities. All in all, a centre where personal service is our byword and hospitality is abundant. When there, don't miss Marianne Thorfve's old-style general store, which in itself is worth the trip. There you will find everything for your stay in the mountains - but also some remarkable souvenirs - for example some Jenny Nyström tapestries from the 30's and 40's. If you want an out-of-the-ordinary experience, let Jan Thorfve be your guide. He is a genuine mountain man who knows every last birch in his territory. 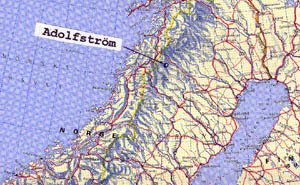 How to get here: Take the E4 Highway as far north as Skellefteå, and there take a left (westward) turn on the Silver Highway towards Arjeplog. Carry on through Arjeplog heading for Bodø (Norway) and 26 km later turn left towards Laisvall. From Laisvall head west to Adolfström and there we are, down by the lake, where the main road begins.